Free Shipping On Domestic Orders Over $99, International Over $500! 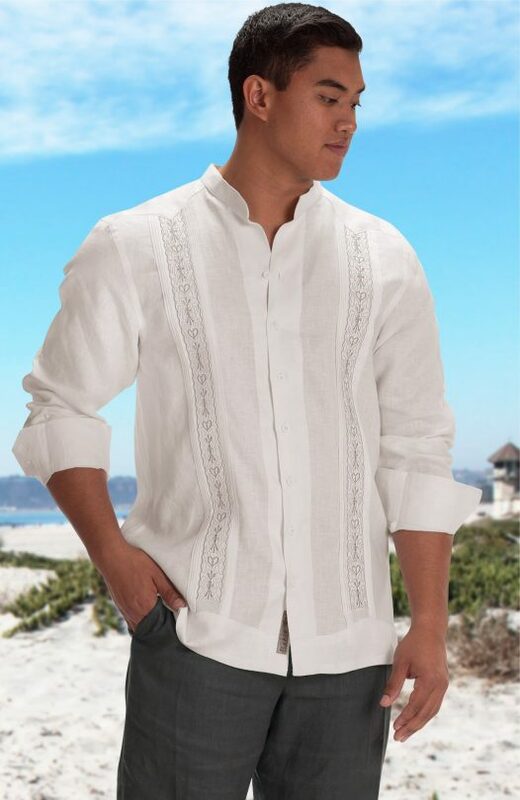 Shop MenWe carry a large selection of unique designer beach wedding attire for men such as custom linen suits, shirts, pants and shorts specifically for grooms, groomsmen, officiants, and guests. Choose between many customization options. For the GroomOur beach wedding attire for the groom is a statement of style, fashion and quality. Meticulous hand crafting of the highest grade linen lends an exquisite elegance you will feel and a detailed sharpness everyone will see. For The GroomsmenOur exquisite linen beach attire for the groomsmen is top quality and while keeping you cool for even on the hottest days on the beach. Shop For PantsSelect from a large selection of different styles of men’s linen pants, including drawstring, dress, and casual. Shop For Suits & VestsOur linen wedding suits are carefully handcrafted using a soft high quality linen for a finished look and sharp appearance. Our suits utilize a full satin lining for comfort and appeal and come in 11 different colors. The Isola features a detailed embroidery and has uniquely hidden hearts that are surrounded by a set of finely detailed pintucks with a banded style collar. Comes standard in a relaxed fit with detailed side buttons and straight bottom hem. Choose from 24 different fabric colors and over 300 different embroidery colors. Select the “Tailored” button if you are looking for a tailored fit. This is a made to order garment, allow approximately 4-6 weeks for delivery. Hover over thumbnail pictures to note product and emb colors colors. Hopefully you can use the picture attached. Thank you for the beautiful shirt. The color of the embroidery matched my dress perfectly.